Upon opening the app, children are presented with a user friendly interface and are able to begin practicing after just two clicks. On the first click they must select one of seven skills: the first four skills comprise of the four operations (addition, subtraction, multiplication and division); the next two options allow them to practice a combination of addition/subtraction, or multiplication/division; while the final feature combines all four operations. The second click asks users to select the number of questions they wish to attempt: 10, 20, 50 or 100, after which they are given a three second countdown before questions appear! Questions are presented as a multiple choice format with one correct answer and three incorrect. This allows users to simply click their answer rather than fiddle entering numbers, thus speeding up mathematical recall. In the bigger picture, this increases the exposure to mathematics, thus developing the user’s mathematical ability. Upon completion users are encouraged to enter their name and record their scores on a leader board, allowing them to compare with other users of the device: friends, family, classmates or even globally (requires a log in to Game Centre). They are also able to repeat the game, view answers or view any misses (incorrect answers). The entire app is focussed around speed and improvement: in addition to its simplicity, children are able to repeat games immediately and to view corrections as well as compare scores on the leader board. This simplicity runs throughout the app, at the same time the presentation of mathematical questions is paramount, with one click answers giving users the ability to answer as many questions as possible in the minimal time. Pedagogically, addition and subtraction questions are within 20, while multiplication and division are within the ten times tables. The developers might consider allowing the user to control this level of difficulty too, appealing to a wider range of audiences, for example, younger children encountering their times tables for the first time. The app recently set the world record for answering 100 random math problems in just 1 minute and 20 seconds! Overall, this app is worthy of a 5 star rating. Highly engaging, stimulating and users are constantly challenged to improve their previous scores. REACTION TIME GAME: How fast are you? How smart are you? Math Racer knows the answer! Compete for the fastest times against friends and family, stamp your initials on the high-score board for all to see. Seven games with four levels each for 28 separate high-score boards! 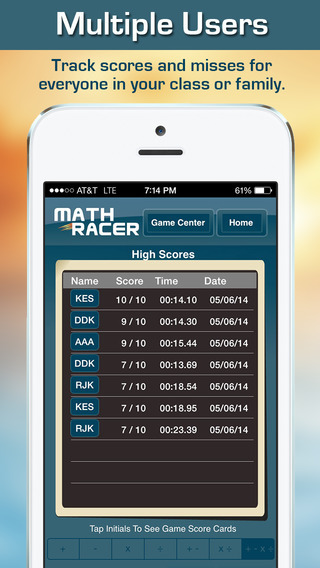 Math Racer is by far the fastest Math Speed Testing App on the App Store. Our simple interface removes all possible barriers between your brain and your reaction time. All times are measured to the hundredth of a second for even more fun. Each user can enter their own initials like in the arcades to keep track of high-scores and game details like exactly how long each problem took and which problems were missed. All user misses are tracked and organized to highlight areas for improvement. Whether you are 99, 3+1 or 36/2 years old, there is a game and a level that will challenge your skills and push you to become faster than you ever thought you could be. Math Racer... Race against TIME! I wanted to push the limits of human ability and find out how quickly people can answer 10 or 100 basic math problems if all barriers to that task are removed. Entering 91 on a number pad and pressing enter can take 2 seconds for many people. Writing the number 55 in pencil can take as long as 4 seconds for slower writers because of the strokes involved. Listening to a verbal question and verbalizing the answer 27 can take as long 4 seconds as well because of the four syllables. When you add up these 2 to 4 second User-Interface delays over 100 problems, they can add 200 to 400 seconds to the total time required. It becomes quickly apparent that Math Tests do not test math calculation, memory or thinking abilities as much as they test handwriting, verbalization or keypad entry skills. 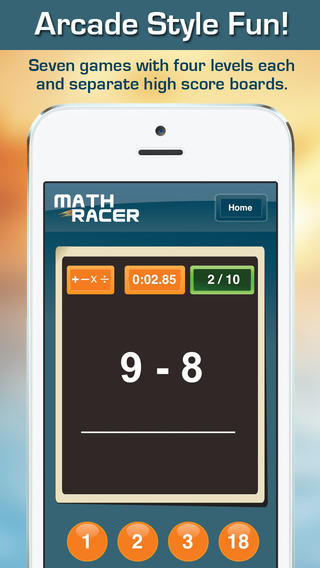 We have shown that it is possible for a really fast thinker to answer 1 math problem every .9 seconds using Math Racer. 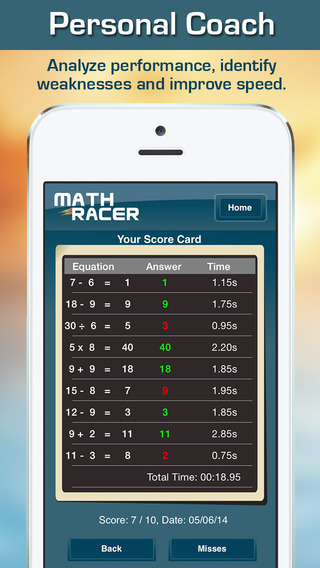 In fact, Math ® is the only app in the app store that measures and records for viewing on the high score board detail view exactly how long it took the user to answer each question in hundredths of a second. The purpose of this game is to even the playing field and test pure math calculation or memory skills alone. Nothing else ever invented for testing math speed even comes close. We think you'll agree. Please let us know your thoughts. 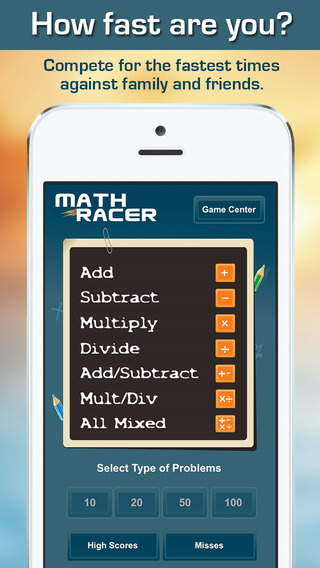 We welcome any and all feedback that will help us make Math Racer even faster. The world record in answering 100 Random Math Problems will likely be set on an iPhone 4 using Math ® in the next 12 months... Maybe YOU will set it!